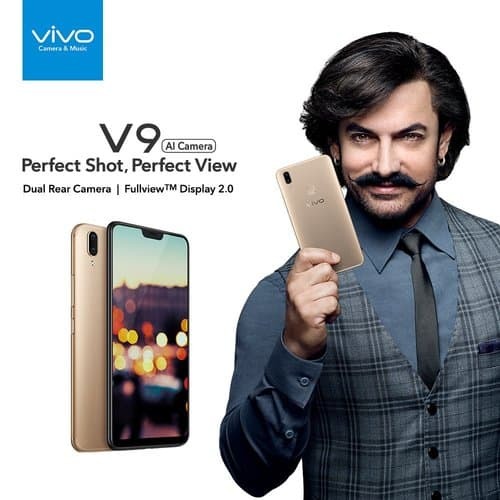 Vivo has launched its newest flagship smartphone in India named Vivo V9. The smartphone’s highlight is its design which matches Apple’s iPhone X. But while the iPhone X costs you a lakh of rupees, the Vivo V9 will be available in India for Rs 22,990 with 4GB RAM and 64GB internal memory. Coming to the hardware, the handset features a massive 6.3-inch screen which has a taller-than-usual aspect ratio of 19:9 and comes with an iPhone X-like notch that houses all the essential sensors and the front-facing camera. The screen has a FullHD+ resolution (2280×1080 pixels) and Vivo claims the screen to body ratio is enhanced to 90 percent. The device is powered by an octa-core Snapdragon 626 coupled with 4GB DDR3 RAM and 64GB internal memory, which can be expanded up to 256GB via a microSD card. In terms of optics, the smartphone houses a dual camera system on the rear consisting of a primary 16-megapixel sensor with f/2.0 aperture and a 5-megapixel secondary sensor for depth sensing to enable portrait photos. The dual camera system further comes with phase detection autofocus and LED flash. The V9 can shoot 4K videos. On the front, the V9 comes with a whopping 24-megapixel camera with screen flash (selfie light). The front camera can record 1080p videos too. The Vivo V9 runs on FunTouch OS 4.0 based on top of Android 8.1 Oreo and is backed by a non-removable 3,260mAh battery. Other features include Wi-Fi 802.11 a/b/g/n/ac, dual-band, WiFi Direct, Bluetooth 4.2, and micro USB 2.0. The smartphone will be available in Pearl Black, Champagne Gold and Sapphire Blue colours in India. It will go on sale on April 2 on all online and offline channels. The device will also be available in all brick and mortar stores across the country.